Reynu Taandon ICW 2018 collection in one word is ‘wearable‘ fashion. Normally, in couture fashion week, one sees opulent over the top royal bridal wear. But this season, surprisingly couture designers have opted for lightweight fashion, which is fun, playful extremely wearable. Pick any of the 55 outfits showcased by Reynu Taandon ICW 2018 collection. Every single one of them has a purpose. Some are fit for bridal wear. Some are good for wedding trousseau. There are some stunning choices in baby pinks which in my opinion are the highlight of this fashion show. 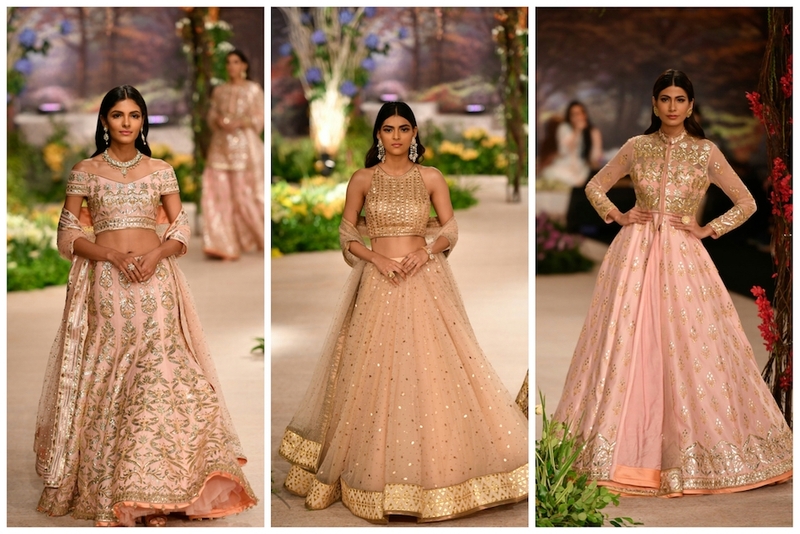 Earlier, the minute one said baby pink lehengas, Anushree Reddy was the only one that would come to my mind. Now, there is a new queen of pink lehengas in the wedding industry. Reynu Taandon, for the most part, does some exquisite bridal wear as can be seen from her previous collections. I did a little sleuthing on the cost of Reynu Taandon lehengas, and unfortunately, the designer is expensive. A decent bridal Reynu Taandon lehenga costs anywhere between INR 1.5 Lakhs to INR 3.5 Lakhs. But having said that, there is no reason why we can’t appreciate good craftsmanship and art. Here is the entire collection from Reynu Taandon ICW 2018. I couldn’t chuck out even a single piece, because they all are so-so good. P.S. Scroll to the bottom if you want to see some real Reynu Taandon Lehenga Prices. My heart skipped a beat when I saw this one. I love traditional handwork with those verticle detailing. It makes the body look elongated and more shapely if you know what I mean. You just look taller than what you are when you wear lehengas with vertical designs. This gorgeous piece with its peachy pink and coral border is beautiful for a reception night party. Love off shoulder lehengas? Then this baby pink Reynu Taandon lehenga with gold embroidery will really make you happy. It looks uber rich with its heavy work and the off shoulder style makes it another reception night party favourite. Easy-breezy yet making a statement. The fit and flare of the lehenga is what is giving these gorgeous Reynu Taandon outfits its magic. You can definitely make one of your own with floral fabric with loads of cancan underneath it. The long jacket trend is very much still in fashion. So in case you have one of these styles stored in your wardrobe, make use of it this wedding season. Oho. This lehenga is on another level. I have tears in my eyes just looking at how pretty this looks. Dainty, beautiful, the blouse style and the overall lehenga look is so perfect for a cocktail/sangeet night event. Whether you are a bride or the bride’s sister, this lehenga is one for the investment and definitely reusable material. You’ve got to love this new green gold combination. I love how one colour, in one pattern has been used to create six different lehenga looks to choose from. Whether you want a long jacket lehenga, or a heavy blouse light lehenga or some other combination. This collection showed end to end what the range of possibilities available at the designer’s store this season. For a change, I’m actually glad I’m not seeing feathers on lehengas anymore. This particular showstopper lehenga for a second gives you the illusion of white feathers on the bottom. But so glad it’s not that. What does Reynu Taandon Lehenga cost?